Now there were gaggles of giggles and lots of lads and lassies having fun doing gardening activities. They were hiding, finding, collecting, calling, listening, looking, poking and joking. Oh the wonderful gardening activities these kids were up to. The adults were giggling too! We watched and then hurried back here to give you some of these ideas to try in your garden with your kids. Hurry now, you're already a few minutes late because of sitting at the computer reading this. Into the fresh air you go; gather up the ankle-biters and enjoy these gardening activities for kids. Was that a chortle I heard from the veggie patch? Follow Building a no dig garden — but child's size. This is a particularly good family gardening activity because a small garden can be built and planted in less than an hour, depending on size and materials used. You do not have to prepare the garden for weeks in advance, as with other growing methods. Let your child choose the shape they'd like... maybe a circle, triangle, square or rectangle. There's no hard digging, you can make the garden on a patch of lawn and the children can see science working... blocking light stops weeds or grass growing; nature recycling materials such as paper, compost and leaves back into the ground to feed new plants; mulch will conserve moisture and keep the temperature more even... and so on. 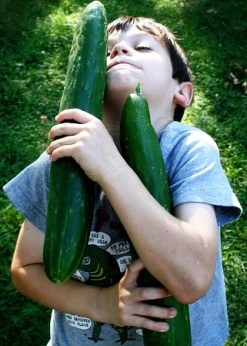 Children love eating things fresh from a garden and they'll feel proud to be part of providing it. When planning gardening activities for kids, especially if they have made their own little patch, make it convenient for them to get to. Maybe plant close to the kitchen where the children can harvest items under your watchful eye. Consider doing quick growing plants. If necessary growing fast plants in containers may be easier so they can keep them on a porch, windowsill or handy place to observe. Radishes are popular with kids; although not always to eat, but they love growing them. The seeds germinate 100% on cue and grow very fast under impatient little gardeners' care. Radishes, cress and some lettuce will be ready the quickest in 6-8 weeks. Next in line are dwarf beans, cucumber, cabbage, tomatoes and onion which will be ready in 8-12 weeks. Most others, including the popular peas, carrots and potatoes will need 16-20 weeks to mature. The children and you could be harvesting from these little gardens for many months. Gardening for families often means practical veggie gardens, planned flower gardens, sometimes a few fruit trees and berry bushes. Often, all a child wants is to grow something of their own amongst the normal garden. Preschoolers and older love to choose say, lettuce or swiss chard. They can plant, water and care for their plant or few plants. 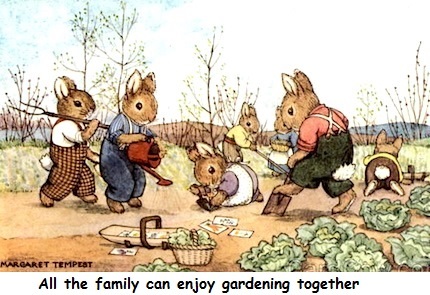 They will skip into the garden at dinner time and pick the leaves, wash them and delight in eating them! They don't necessarily need their own garden or their own corner... they may happily spend time with you in the garden, but they will treasure having their own plants. Help them choose a flower too, which they can care for in the same way — maybe not to eat though unless they're edible flowers... do check first! 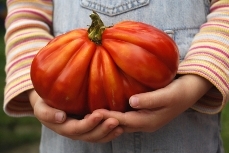 Kids love the idea of growing a vegetable 'bigger than the greatest, biggest, hugest, most enormous pumpkin/carrot/bean/tomato/... fill in blank, ever, ever seen! Got a zucchini that's gone bananas? 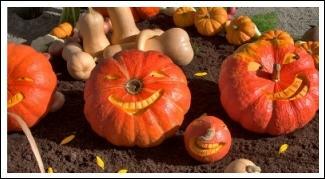 It's lots of fun carving vegetables, especially the soft ones like zucchinis (courgettes). A zucchini is easier to carve than trying to spell it! 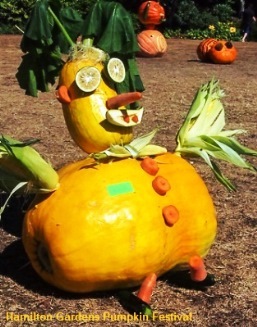 Carve your zucchini into a face, or hollow it out and make a boat. Put in some sticks for masts and for extra dexterous older kids they can carve out portholes and add other imaginative touches from the garden. Even little ones can be decorators to poke sticks, flowers, leaves, seed heads, moss, lichen, bark, tendrils etc into soft veggies. A sharp knife isn't necessary; a stick will do to make the holes. Spuds can be painted with water paint, or pens. Sticks or toothpicks make legs. Hardy leaves can be threaded on hat elastic to make a skirt. Parsley makes great hair perched on top with a dab of glue. Kids love them. 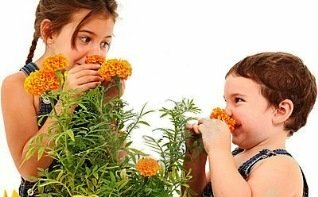 They are wonderful to grow as a kid's gardening activity, if you have the space and it's not too windy. Against a fence or house is best. Buy some edible de-hulled sunflower seeds... hold it... don't plant these, they're for eating. 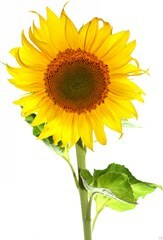 Then buy the un-hulled garden seeds and grow some so kids can then see that sunflower seeds come from the flowerheads. If you do want to eat your sunflower seeds from the flowerheads, wait for the flower to die, mature and dry somewhat, then pick and finish drying in a dry, warm place. You'll need to pick the flower heads before the birds or mice get them (yes, field mice love to scamper up sunflowers to get to the seeds). When the flowerheads are dry you can bang and shake out the sunflower seeds to eat. For biggies, try: Grey Stripe Giant Sunflower—flowerheads about 60cm (2ft) wide. Russian Mammoth Sunflower — at least 518cm (17ft) high. 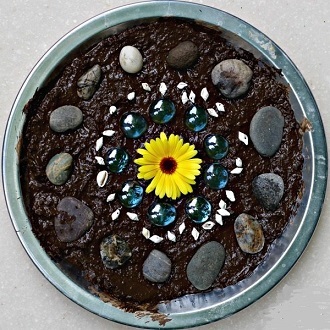 Talk about absorbing and creative... first let's get into squelchy mud and bake a cake. This is so much fun for a child. Decorations, such as leaves, flowers, grass, seed heads, stones, even beads etc. 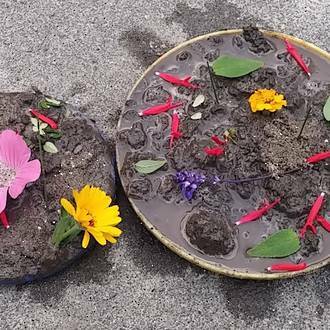 Mix up the mud with the help of your child. Use hands or wooden spoon. Mix the dirt, some sand and water in a large bucket or bowl. The mud should be very thick. Your child can now put the mud into the dish to make the pie. Take as much time as your child likes. They love to squeeze and feel the texture, then smooth and shape the mud. Then the decorations can be added, before letting the mud pie bake in the sun. Looks good and is an excellent hands on nature play experience. Wash a 2Lt plastic bottle (soft drink or soda water type) and using a knife or sharp scissors, cut it in half along one long side. Force it open like a hinge and fill one side with good organic potting mix. Sprinkle seeds lightly over and poke in a bit or cover with fine layer of soil. Water gently, and close lid leaving a small space for air but closed enough for a bit of humidity to trap heat. Put on windowsill or warm place — dark is ok until seeds sprout. Once seeds have sprouted they must be put in a light place, preferably with morning or late afternoon sun. When their first true leaves appear, carefully water or use a spray bottle filled with a very light mixture of water and liquid fertilizer. This will kick start the seedlings into becoming grown-up plants. Close the bottle back up each time, but watch for fungal nasties and if spotted open lid and put bottle outside in fresh air and spray with fungal spray. This little greenhouse should be well on the way to producing seedlings ready for repotting in roughly 2-5 weeks. Shoe gardens — Sneak a garden in a sneaker! That's right, sneakers, boots, and old school shoes that ain't gonna walk no more, can now grow old gracefully, well at least usefully. Cut or poke a few holes in the soles (sneakers soles are the easiest). Fill with seedling mix and sprinkle on some seeds then cover lightly and water. OR, use big seeds, such as peas and poke them into the soil individually. 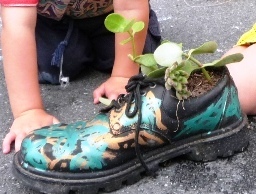 These unique and personal shoe garden planters really do capture children's interest because they can feel proud of what they achieve... which is an almost instant little salad or a delightful show of flowers or succulents.